Whether you are building up your kitchen or merely rebuffing it, you always have to make sure that you plan what to place there. From functional appliances to colour schemes, you have to ensure freshness and efficiency at all times. In a world of fast-paced advancements both in technology and arts, you have to keep up with all the trends for your home. To guide you in making your homes more efficient, we have rounded up kitchen trends you can get for your home. When selecting from one of these trends, you have to make sure that they would cater to your style. Not only will you look at their freshness regarding design, but how functional they would be to address your kitchen needs. Moreover, it would help if you made sure that there are balance and harmony concerning colour and overall aesthetics. Without further ado, here are the ten kitchen trends you can get for your home. Combining vintage finishes such as unlacquered silver and brass travertine with contemporary styles such as monochromatic hues would be fun to do. Playing with the rustic and modern ways is an exciting way to create a distinct yet thoroughly thought out design for your kitchen. Not only will the elders love it, but your kids would also enjoy its design as well. Rustic yet hip, dainty yet current, combining both of these styles would inevitably bring about a soulful atmosphere on your kitchens. The use of islands with different purpose would also fit the kitchen trends you can get for your home. When designing your kitchen, it is essential to place an island so that you would have extra space when cooking. However, above all else, you should make sure that the island that you will choose will have other uses as well. You could keep your condiments more organized by placing small cabinets on your island. If your family tends to be busy in the kitchen, these cabinets could also store several of their things, including the toys of the kids or the books of your spouse. It is true what they say, the colour you choose for your kitchen reflects your personality or your needs. Hence, if you are aiming for a bright and welcoming atmosphere, you should use vibrant colour schemes. Using such colour schemes would also make your kitchen fresh and modern. They could also exude positive energy which you could take in when cooking. Orange, bright green, pink, and warm yellow have proven to be active hues in making kitchens radiantly beautiful. An increasingly popular kitchen trend is the removal of upper wall cabinets. Since they take up most of the visual space of your kitchen, removing them could make the area brighter and more extensive. Moreover, it would also allow you to use the countertop space more efficiently. Where then would you place your appliances if you would remove your upper wall cabinets? It is essential that you look for better storage solutions for these things. For example, you could develop drawers for your condiments. You could also create appliances garages for your kitchen appliances. These would make storage more effective. When speaking of the kitchen trends you can get for your home, the colour contrast would frequently be on anyone’s list. This is because contrasting colours are very trendy in nature. You could mix and match pastel colours with darker pallets to create a diverse colour combination on your kitchen. Another purpose of using contrasting colours is to spotlight features of your kitchen. Using different colours will also create a dramatic feel in your kitchen. The darker colours will highlight the pastels, creating a wow factor on your kitchen. The kitchen could be a dangerous place for your dear pets. Ideally, it is best to keep them out of the kitchen since they can catch injury from the appliances and tools found here. However, current trends say otherwise. As a pet owner, you should see to it that the kitchen space is conducive for your pets. To begin with, you should place a feeding station near the corner. You could even create your kitchen island with a bed made explicitly for your pets. Traditionally, our kitchens are lit by fluorescent lights situated directly above us. To make things more aesthetic, we could conceal our lights under the worktops to make your kitchen a little more entertaining to observe. By doing so, you could illuminate a room better and create an illusion of contrast rather than casually placing them above you. Disguising them into plasterboards is also a kitchen trend which is becoming common in many homes. Mixed metals are still kitchen trends you can get for your home. By combining various metals such as brass and steel, you could create striking focal points around your kitchen. Moreover, mixing metals with your metal appliances work well, too, especially if these appliances are in strong colours such as red, blue, and black. When you pair these materials with warm colourways, these materials could create a statement within your kitchen. In most kitchens, the cooker hobs become the focal point due to its size and structure. Since this is the case, then you should make it more dramatic. Stash some colours on it, such as gold or black, to make it more eye-catching. Black hoods, in particular, could help set a glamorous and sophisticated look of your kitchen. This holds true, as long as you have an all-white kitchen. Since we’re talking about kitchen trends you can get for your home, we cannot not talk about technology. Smart kitchens integrate technology into every appliance and functionalities of your kitchen. This would range from your refrigerators to your lighting. With the use of sensors or buttons, you could quickly turn on your faucet or alert you when the coffee maker is already done brewing. There are also smart gadgets which are designed to monitor your grocery items, to regulate the heat when cooking, or identify the rotting eggs. The possibilities are endless! Smart kitchens have got to be one of the most significant trends this year. From colour combinations to smart kitchens, these trends will surely create a fresh look on your kitchens. They are designed to keep you up to date with the newest raves on kitchens. 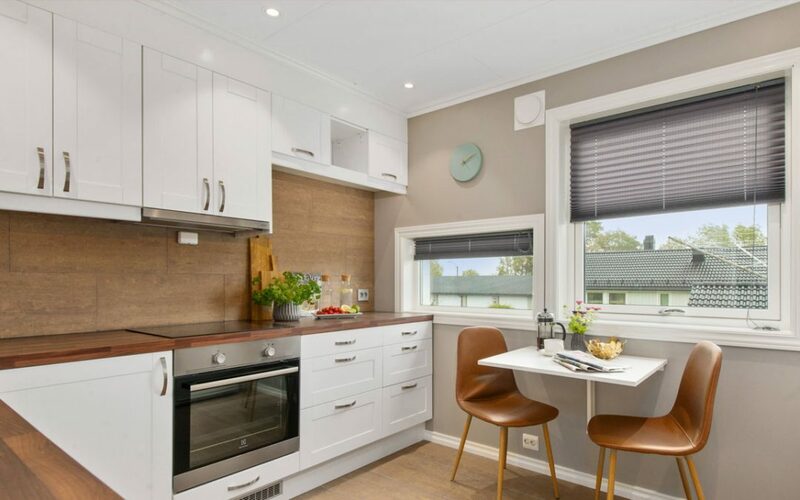 So if you’re still unsure what to place when planning your home, never forget to choose from these kitchen trends you can get for your home.